Cypriot cinema in Cannes- Lullaby of the butterfly by Tonia Mishiali in the short film corner of Cannes Film Festival. View the announcement at FNE HERE. 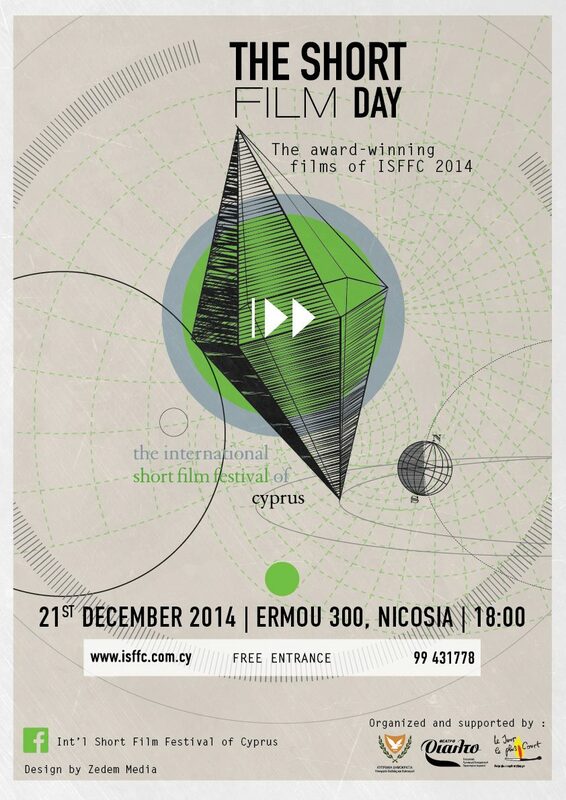 Cyprus Events announces the ISFFC Cypriot short films screenings in Nicosia. HEYevent site announces the screening of LULLABY THE BUTTERFLY in Nicosia. The Ministry of Education & Culture promotes Cyprus as a Filming Destination. Tonia Mishiali and her films DEAD END and LULLABY OF THE BUTTERFLY are mentioned as award winning films. The international Short Film Festival of Cyprus screens the winning films of the 2014 Festival at the Short Film Day Event in Nicosia. View the announcement on CITY FREE PRESS. View the announcement on RIKnews. The Short Film Festival in Drama travels to Athens. “Lullaby of the butterfly” listed on Passages Blogspot. View the listing online HERE. An article on the winners of the ISFFC (The International Short Film Festival of Cyprus) on palo.com.cy. “Lullaby of the butterfly” wins BEST NATIONAL FILM and BEST CINEMATOGRAPHY awards. Lullaby of the Butterfly, a film about a mysterious crime directed by Tonia Mishiali, won the 1st Prize in the National Competition of the 8th Cyprus International Short Film Festival which took place 11-17 October 2014. The jury stated that Lullaby of the Butterfly directed by Tonia Mishiali was selected “for the accuracy of the script and the courage of directing a complex, troubling, moving short film”. The winners of the ISFFC (The International short film festival of Cyprus) are announced on the official site of the Festival. For the accuracy of the script and the courage of directing a complex, troubling, moving short film the 1st Prize for Best National Film accompanied by the amount of 4000 euros goes to Lullaby of the butterfly by Tonia Mishiali. Για την ακρίβεια του σεναρίου της και το θάρρος να σκηνοθετήσει μια τόσο περίπλοκη, ανησυχαστική και συγκινητική ταινία, το Πρώτο Βραβείο Καλύτερης Κυπριακής Ταινίας Μικρού Μήκους συνοδευόμενο από το ποσό των 4000 ευρώ απονέμεται στο Νανούρισμα της Πεταλούδας, της Τώνιας Μισιαλή. 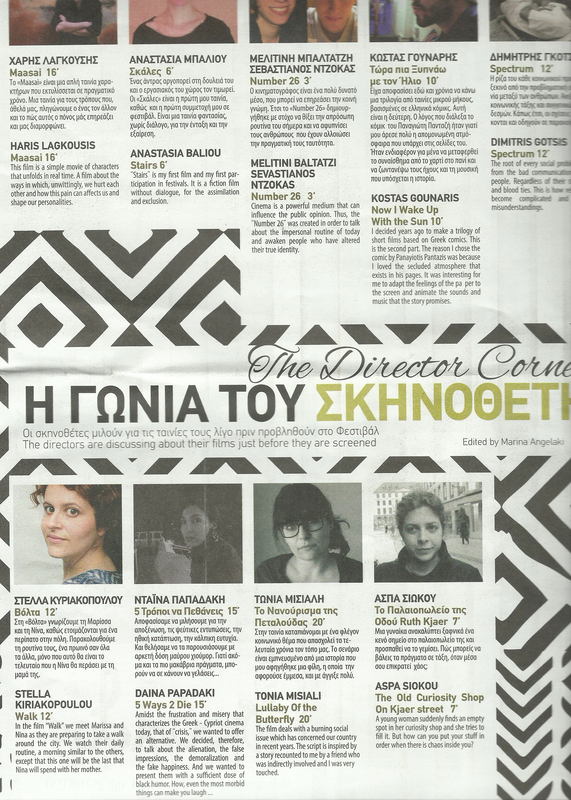 Phileleftheros newspaper announces the winners of the ISFFC (The International Short Film Festival of Cyprus). “Lullaby of the butterfly” wins BEST NATIONAL FILM and BEST CINEMATOGRAPHY awards. Lifo.gr has written an article on the awards of the International Short Film Festival of Cyprus. He has no review on Lullaby of the butterfly but he mentions that we got 2 awards and adds that he has not seen the film himself but heard the best comments about it from others during the Festival. Θέμα για κοινωνικό προβληματισμό παρουσιάζει και το αναπάντεχο φινάλε της ταινίας Το Νανούρισμα της Πεταλούδας της Τώνιας Μισιαλή, αν και δεν επικεντρώνεται τόσο στο κοινωνικό κομμάτι όσο στο πιο εσωτερικό και υπαρξιακό της κομμάτι, μια ταινία με εξαιρετικά δουλεμένη αισθητικά εικόνα που η ατμόσφαιρα της σε εμπλέκει στον εσωτερικό κόσμο της ηρωίδας. A subject of social concern is presented by the unexpected finale of the film Lullaby of the Butterfly by Tonia Mishiali, although it does not focus so much on the social part but on the innermost and most existential one, a film with an extremely well crafted image aesthetically, and with an atmosphere that engages the innermost world of the heroine. Lullaby of the Butterfly at the 20th Athens International Film Festival ‘Opening Nights’. View the info on the Official Site of the Festival. H Τώνια Μίσιαλη εντυπωσίασε με τα εξαιρετικά στημένα πλάνα και γενικά με το με λεπτομέρεια προσεγμένο στιλ της, στην κυπριακής παραγωγής ταινία της «Το νανούρισμα της πεταλούδας». Tonia Mishiali impressed everyone with the excellent shots and generally with her detailed and attention-to-detail style, in the Cypriot film production “Lullaby of the butterfly”. Lullaby of the Butterfly listed on the SEECinema site. “Lullaby of the butterfly listed on ShortFilm site. “Director’s Corner” features the Directors of the films screening every day in the Festival magazine. “Με εξαιρετικά διαπιστευτήρια από το βραβευμένο «Dead End» του 2013, η Τώνια Μισιαλή αποδεικνύει για ακόμη μια φορά το ταλέντο της στο να σκηνοθετεί ιστορίες που βάζουν τον θεατή βαθιά μέσα στην καρδιά τους. Εδώ η αινιγματική απόφαση μιας γυναίκας να πράξει κάτι που μοιάζει να είναι καθοριστικό για τη υπόλοιπη ζωή της, μετατρέπεται μέσα από ένα οξυδερκές, ατμοσφαιρικό και ευαίσθητο βλέμμα σε μια ιστορία (ανθρώπινου) τρόμου που υποβάλλει και γοητεύει πριν αποκαλύψει στο φινάλε της μια ανατροπή που έρχεται καλοδουλεμένα (και άρτια αισθητικά) να ολοκληρώσει την προβληματική της”. “With excellent credentials from award winning «Dead End» of 2013, Tonia Mishiali proves, once again, her talent in directing stories that make the viewers search deep into their hearts. Here, the puzzling decision of a woman to do something that seems to be crucial for the rest of her life, is transformed through an insightful, atmospheric and sensitive look at a (human) horror story which conquers and charms before it reveals, at the finale, an overthrow which is skillfully presented (and aesthetically perfect) to completion”. The online film magazine flix.gr dedicates, every year, an article on the Directors and their films that compete in the Short Film Festival in Drama. Click HERE to read the article on “Lullaby of the butterfly“. Article written by Poly Lykourgou. Politis Newspaper and parathyroid.com have dedicated an article on “Lullaby of the butterfly”‘s World Premiere in Sarajevo Film Festival. Click HERE to view the article online. Cineuropa on Sarajevo Film Festival’s Line-up. Lullaby of the butterfly selected to make its world premiere. Cinefreaks.gr announces Sarajevo Film FEstival’s lineup mentioning LULLABY OF THE BUTTERFLY by Tonia Mishiali as a World Premiere. Also mentioned on Alexander Kakavas blog as a world premiere in Sarajevo. 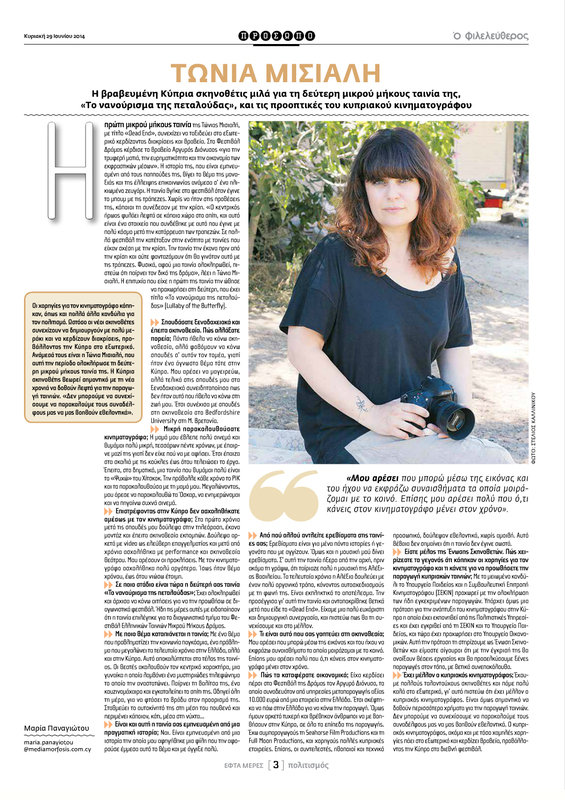 Maria Panayiotou form Fileleftheros Newspaper dedicated the section “ΠΡΟΣΩΠΟ” (FACE) to Tonia Mishiali and her short film “Lullaby of the butterfly”. 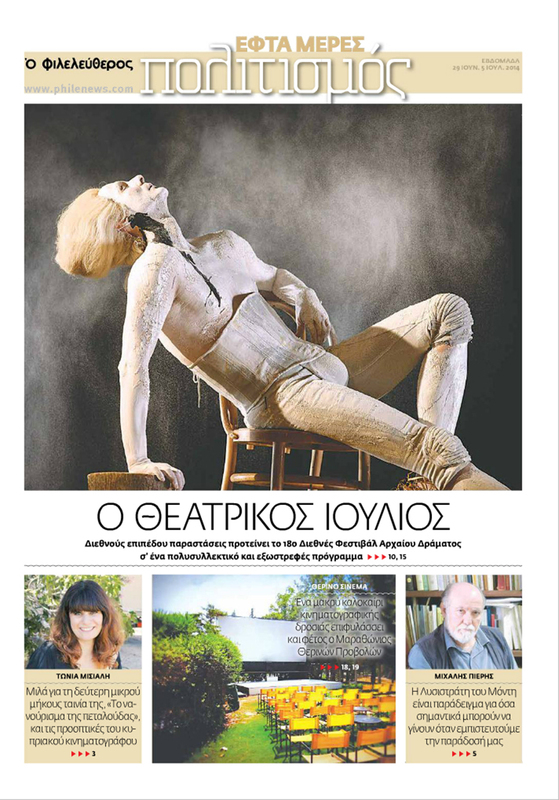 Meropi Moyseos has written a beautiful article in POLITIS Newspaper about LULLABY OF THE BUTTERFLY.